Do you know how your guests are behaving in your property? 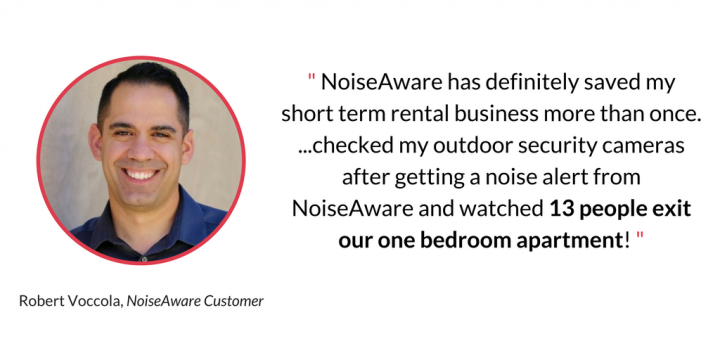 Noise monitoring by NoiseAware can prevent a complaint before it becomes an expensive problem! The only privacy safe solution for your rental! There's no climate too tough for NoiseAware. Monitor any area of your property. You'll have access to real-time and historical data to get a full view of the noise at your property 24/7. We don't record any content and only measure noise levels to protect the privacy of guests. You customize the settings & NoiseAware monitors your property so you don't have to. Does your city have strict fines for a noise violation? Numerous cities are raising fines - up to $1,000 for the first violation. Equip your property with our noise sensors and we'll monitor all the activity zones automatically. We send you a text when we notice a problem. Preventing noise violations is much better than hearing about them after the fact. Don't wait, the risk of a noise violation at your property could be high! Our CEO rented out his property to one guest who threw a huge party. He was soon forced to sell his property - at a significant loss - due to the nightmarish aftermath. He founded NoiseAware to help prevent anyone else from experiencing the same noise-driven disaster. Drop us a line and we'll be happy to share the story.